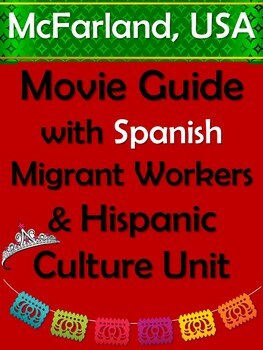 This 125+ page EDITABLE McFarland, USA Movie Guide with Migrant Workers and Hispanic Culture Unit in Spanish has all of the vocabulary, cultural information, and enrichment activities you need to teach this wonderful movie. Students of all levels will love this heartwarming movie and they will enjoy learning the cultural elements from this film. 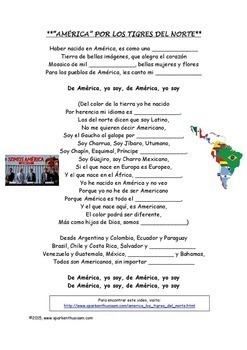 The video activities include songs by Los Tigres del Norte and Juanes as well as interviews with the actual students and coach who inspired the film. Child labor, quinceañeras, and the role of migrant workers are also interesting and important themes from the film. There are activities for all levels of students from beginning through advanced in this thorough and time-saving movie packet. *Complete list of all videos and songs for this movie. 2) McFarland, USA is Rated PG and is appropriate for all audiences from the 5th grade and on. Visit our Spanish-speaking countries and culture section on our website!